Clean pick-up of all crop types with new heavy duty 5-bar pick-up with heavy duty tynes. The new double auger with integrated feeding roll allows high capacity baling in large windrows. Whether you use the ISObus monitor in your tractor or the Case IH AFS Pro 300 or Pro 700 touchscreen monitor, the baler’s standardized software and intuitive operator interface keeps you in total control from the moment you start to bale. You can make tuning adjustments on the move without leaving your seat and the self-diagnostic alarm system will keep you fully informed should any problem arise. The unique bale performance monitor gives you full control from the moment you start to bale, with twine or net available at the touch of a button. The touchscreen control system with manual or automatic modes enables you to operate all the baler’s major functions. The operator interface is clearly laid out and intuitive enough that even new drivers of Case IH RB balers achieve maximum productivity from the start. All essential set-up and operating data are at your fingertips, including the number of bales produced during the day, chopped or unchopped, wrapped with net or twine. The monitor provides you the information you need to quickly resolve any service issues. In addition, once the baler is set up, you never have to change any settings, even if you use a different tractor – the control system remains the same whether you use the Case IH monitor or any ISOBUS tractor terminal. As the bale chamber fills, sensors record the size and condition of the bale. This allows the operator to drive down any size or shape of windrow and maintain the optimum bale shape and density. As soon as the desired bale size is reached the bale is automatically wrapped with twine or net, ready for the operator to eject. It’s simple, fast and very efficient - the ultimate in flexibility. With the RB electronic system, operators can choose twine or net and change the rolls in just a few minutes. 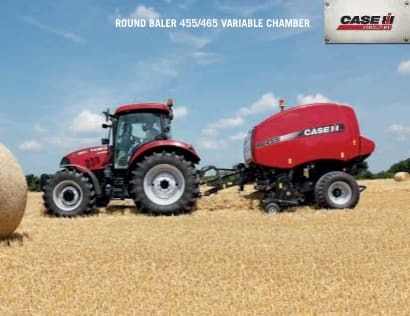 You can count on the RB variable chamber balers to work at high speed with great precision, leaving no trace of crop in the field, delivering high productivity in all conditions and all crops. The new 5-bar pick-up will make short work of heavy windrows. The pick-up feeds the rotor feeder or cutter through an enlarged opening so that it can easily handle heavy crops. The new high speed 5 bar pick-up features a new heavy-duty rubber mounted steel tyne designed to feed at high working speeds. The high capacity dual side augers feed the crop to the rotor or cutter assembly assisted by a top feeder roller for even greater capacity. The variable chamber is perfect for customers who need a flexible bale size to suit their crop and storage conditions. To produce the ideal core, belt tension and core density are controlled by coil springs. As soon as the core is formed and the bale starts to grow, the belt tension and density are increased dramatically. For exceptionally high density requirements, powerful dual hydraulic density cylinders control the position of the belt tension arm. An easy to adjust density control valve allows the operator to make precise and accurate adjustments to suit crop conditions and customer bale density requirements. During operation a pressure indicator gauge can be viewed from the cab. The net and twine wrapping cycle can be started either manually or automatically from the monitor to suit individual requirements. The net or twine wrapping of the bale can easily be viewed from the tractor. Twine or net roll are easily and quickly loaded from the front of the machine.